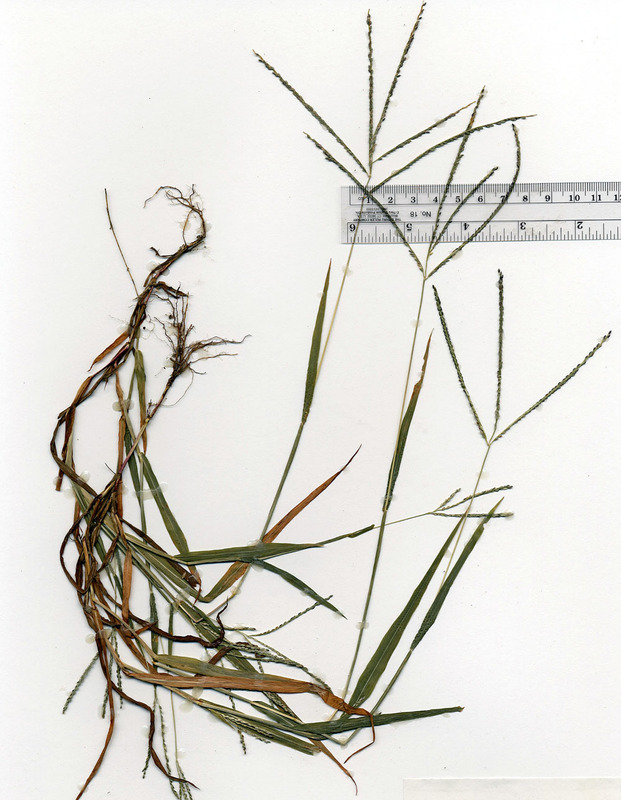 Digitaria ischaemum.Billy E. Warrick Ph D. Uvalde Research and extention Center.Texas A&M University System.soilcropandmore.info (Accessed 6/2014). Digitaria ischaemum is a summer annual, C4, grass (Waller and Lewis 1979), prostrate to ascending, loosely tufted, usually not rooting at nodes; mostly hairless, except upper margin of sheath. Leaves 5-15 cm long, 0.4-1 cm wide, bright, pale yellow-green. Flower spikelets 1-flowered, about 0.2 cm, elliptic, first glume small to none, second glume and sterile lemma about equal, both glandular-hairy between veins, lemma becoming dark purple-black or brown; inflorescence of 2-5 spikes 4-10 cm long from near the top of the flowering stalk, spike axis winged, July-Oct.
Habitat: Common in lawns, gardens, roadsides, edges and disturbed open areas. Notes: Much like D. sanguinalis, somewhat less common. plants eaten by rabbits (Martin et al. 1951).